Pfizer has announced it recalled seven lots of its blockbuster cholesterol fighting drug Lipitor in August. The recall, in the U.S. and Canada, was due to reports of an "uncharacteristic odor related to the bottles in which the product is packaged," the company said in a statement. A total of 191,000 bottles of Lipitor were recalled, according to Rick Chambers, a Pfizer spokesman, who provided a written statement to CNN. When asked about the timing of the announcement, Chambers explained that the recall notice was posted on the FDA site on Thursday. In his statement, Chambers said the recall included, "three additional lots of atorvastatin [the generic name for Lipitor] that Pfizer supplied to a Canadian company." He added, "All the lots were packaged in the same batch of bottles from a third-party supplier." "Pfizer has been working closely with the bottle supplier to determine the cause of the odor problem and to rapidly address it. We don’t anticipate a product shortage resulting from the recall." "A medical risk assessment based on all the information we have has determined that the odor issue is not likely to cause adverse health consequences for patients," Chambers continued. "We received three reports of odor problems during the month of July, which translates into a frequency rate of less than one report per one million bottles of product packaged." "Pfizer will be actively monitoring the situation going forward to ensure patient safety," Chambers said. Next entry »Confused by new health insurance options? Consider this those of you with so called high cholesterol. Cholesterol is normal and high amounts is your body making it to fight off something else. We make the mistake of trying to lower it with drugs that don't work and cause other problems. Cholesterol is good. High amounts is a sign you should be eating foods that nourish you and not that just taste good. Eliminate breads, pasta, soda, fruit juice, alchohol, and all other processed foods and eat grass fed meats and butter, real free range eggs and low carb vegetables. Supplement with coconut oil and make sure you gets lots of sun and add vitamin D3. It will take some time for your body to adjust and it works. Get the book by Dr Weston Price Nutrition and Physical Degeneration. The good news? Our bodies rebuild with the proper food. Be patient or be a patient, it's your choice. Good Luck. this drug should never have seen the light of day. I took it for a year and before I quit was suffering from dizziness, numbness, tingling, speech issues, vision problems, memory issues, balance issues, and all kinds of fantastic stuff. my cholesterol dropped 8 points for all of that. Some of these have yet to go away completely. neurologist confirms NO DISEASE. It was all a side effect. Neal: Your kidding right ? Lipitor has saved thousands of lives and hospital stays. High Cholesterol causes stroke,Heat Attacks and AS. 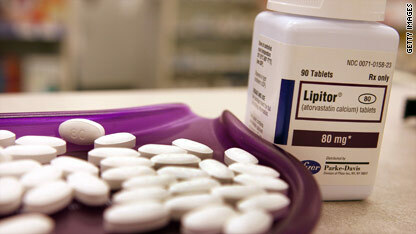 Lipitor has proven extremely safe as millions of doses and years of study have shown. Hyper Cholesteremia is in many cases hereditary and no diet or exercise will change that. Cholesterol levels above 200 are dangerous and you are risking your life if you do not treat i medically. Mark: Of course there are side effects. Thats why a prescription is required, so that adverse reactions are reported and the medication stopped. The incidence of untoward reactions is extremely low as can be noted by the detailed literature. Millions of people has consumed millions and millions of doses of Statins and there ace been less then 1 % incidence of adverse effects. Every prescription product has side effects to someone, that is precisely why a doctor has to write for it. Just bet these bottles are from China! Like all the other bad stuff that was recalled. Or the medicine. When the heck is this country going to learn it is better to pay the price to the workers in the United States than to get all we get from other Countries. For what ever reason I do believe our Government wants to kill us all of here in the United States. All of the Children's Tylenol and Ibuprofin products were produced in America. The plant that they were manufactured from was in PA. This happens in every country that tries to save money by cutting corners. When is this country going to start producing quality products? Between the pharmaceutical, automotive and food industry, its all about producing cheap and nasty trash... ...that not even the Chinese would want to buy! You are an ignorant person who I bet doesn't even know where China is. While I completely agree that we must do much more to ensure that our drugs are safe, it does not mean you can make these false accusations that China is to blame. I agree we need jobs in the USA! It was not made in the USA for one. Two even the workers in the pharma industry inside the United State are not citizens. Point three. The majority of graduate students at our top universities being train to make drugs also are not citizens. .... funded with your tax dollars. And we are expected to take their word for this? Drug companies have a credibility problem. Maybe you should make it in the USA? The solution to the odor is as simple as changing the drug presentation practice . Plastic is plastic and since we are all talking about protecting the environment and recycling, why to use such big bottles in the first place to pack let's say 30 pills? Imagine the amount of bottles used every day to supply the drug to millions of people in the USA? I lived in Thailand for 6 years and started taking Lipitor while living there. The drug was packed individually in a foil presentation. Each and every pill is isolated in its own little pocket, so contamination is not possible unless the user doesn't handle it properly. Go back to that presentation and the problem will be solved. Besides, for those of us who need to break the pill in half every day, it is easier to control what pill has been broken in half and therefore, being able to keep the other half isolated from the rest of the pills. Let's use our common sense and move away from using so much plastic bottles that are contributing to so much waste in the USA. Individual packing of the drug is the solution. What am I going to do now? Am I supposed to stop taking Lipitor just like that? I am sure my doctor doesn't have the answer and I am not planning on taking a different medication. Who is going to take responsibility for this? And, don't tell me that individual packing is going to cost more, as the drug is already very expensive in the US, but not so in the rest of the world, where the drug is sold packed individually. Neal, I know about Dr. Price and agree with much of what you say about your diet. Coconut Oil is very good for you but the main stream "experts" don't know that. However, I do not agree that high (LDL) cholesterol is "good" for you in any way. I believe it leads to buildup of plaque in the arteries. I know this first-hand. That said, it is best, if you can, to lower your cholesterol naturally through diet and exercise. That means nutrient-dense foods that also carry fewer calories. Dr. Joel Fuhrman is a very good source of information in this areas. Basically and simply, very high levels of vegetables and fruits, beginning with a ton of dark, leafy vegetables like kale and spinich. The jury is out for me on grass-fed meat and free range chicken and eggs, even though I realize it is a healthier option if you still plan on eating those foods. Gee and this is the drug that has blocked it's generic from being marketed. All that money and it still stinks. No poor doctors and no poor drug companies, let's hope they all stay out of the voting polls. Likely yet another fine product (the bottle), brought to you by the C-H-INA corporation! Don't worry, next time they'll make sure to include some lead paint or asbestos!! I tookLipatorfor 8 years and brought my cholestoral down some. Then I started having the muscle cramps and aches that the ads warn about. Stopped taking Lipator nearly four years ago but still have aches and pains; called periphael neuraphy and no cure; just a live with it; will never take another statin drug; acording to reports, half of heart attacks occur in people who have low cholestoral; just a marketing program par excellence to a gulliable public; need to treat causes, not give drugs for symptomes. Feel fortunate I do not have the kidney problems and mental problems many report.. Took Zocor for 4 weeks and got weird muscle tingling sensation in arms and legs. Stopped taking the medication and had blood test done. Tingling sensation took about 4 months to completely go away. Switched to Zetia which isn't a statin and also take Niaspan. Cholesterol is much lower with no side effects. This article lays it out clearly. STAY away from Doctors and their pushing of drugs...they are toxic to the human body. Companies never look for a cure they only look to treat an aliment..curing would cause no profits. It amazes me how people can ot comprehend what they read, This story is about the BOTTLES not about the medicine. All you of folks whining and hollering about the medicine need to go back to school to learn how to pay attention. denvernaturopathic.com??? Hmmm??? Guess I'll throw out JAMA and the New England Journal. i have a bottle in my possession not sure what to do with it.. i noticed a weird smell and rather strong smell. coincidence or not i am allergic to mold and have had some pretty severe asthma and walking pneumonia stuff going on and hard time breathing. not to mention the pharmacy has not sent any notification either.